I can't believe I've been away for this long. This has got to be my longest blog hiatus ever. I remember, not too long ago, in December, I was making crazy plans for the blog this year and was working on a few interesting ideas and stuff and then one thing after another happened and before I knew it we're almost at the end of Jan. Well, better late than never I say. I hope you guys had a fantastic holiday season. I can't wait to catch up with what everyone's been upto. To start off this year's yumminess I have a treat for you. I found myself picking up a crazy amount of spinach at the market the other day and didn't really wan't to make the same stir fry that I normally make with spinach - I have to share that with you sometime soon. I wanted to make something different, more like a meal in itself. After a few minutes of looking around a few sites, I found this recipe. The picture looked amazing and I think that sealed the deal for me. The recipe was pretty simple. However, I used my own shortcrust pastry recipe instead of the one mentioned here. I can't get myself to use shortening in a pie crust. I don't know why - it's just me, I guess. For me, it has to be butter all the way. 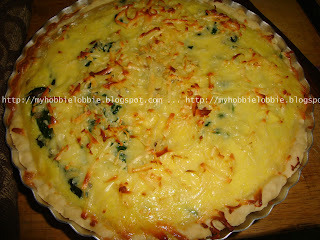 I made a few additions and changes to suit our tastes and ended up with a truly gorgeous spinach quiche. If you have trouble eating your greens, this is for you. Cheese makes everything taste better and we loved the delicate flavors. I'm thinking of throwing in some pieces of fried bacon next time to switch it up. This time around it was completely meatless. Have any of you made a pie crust at home with shortening. If you have, I'd love to hear how it turned out. Maybe, I'll give your version a try the next time. Rub the cold butter into the flour and salt mix using your fingers or cut the butter into the flour using a pastry cutter till is resembles wet, coarse sand. Then gradually add 2-3 tbsp ice cold water to bring the dough together to rolling consistency. Don't over roll as this will make the crust dense. Press the dough into a disc and cover in plastic wrap and refrigerate for about 20 minutes or till needed. Dollop a tbsp of butter in a large pan and saute the cleaned and washed spinach till it has wilted and the excess juices have dried up. You can do this in batches depending on your pan size and quantity of spinach. When almost done, sprinkle with salt and pepper to taste and keep aside. Using the same pan, place a little olive oil to it. Add the chopped garlic and saute till fragrant on medium-low flame. Add the chopped onion and stir fry till the onions turn translucent. Take it off the heat and keep aside. In a bowl, beat the eggs and cream together till combined. Season with salt and pepper to taste. Roll the pie crust to fit the size of your pie dish. You can use a 7"-8" dish for this. If you have a ceramic pie dish, I suggest you use it. I used a regular loose bottomed one and had a little spillage - nothing too bad though. Place the crust into the dish and trim the edges. Prick the base using a fork. Bake in an oven preheated to 200ºC for about 8 minutes. Take it out of the oven and let it cool for a couple of minutes. Mix the sauteed spinach with the onion and garlic mix and add 1/2 a cup of grated cheese to it. Mix well and spoon into the crust. Pour the egg-cream mixture over this slowly to avoid spilling. Sprinkle the remaining grated cheese to cover the top. Bake at 200ºC for 30-45 minutes or till the quiche has set. Cut into wedges and serve with a salad. 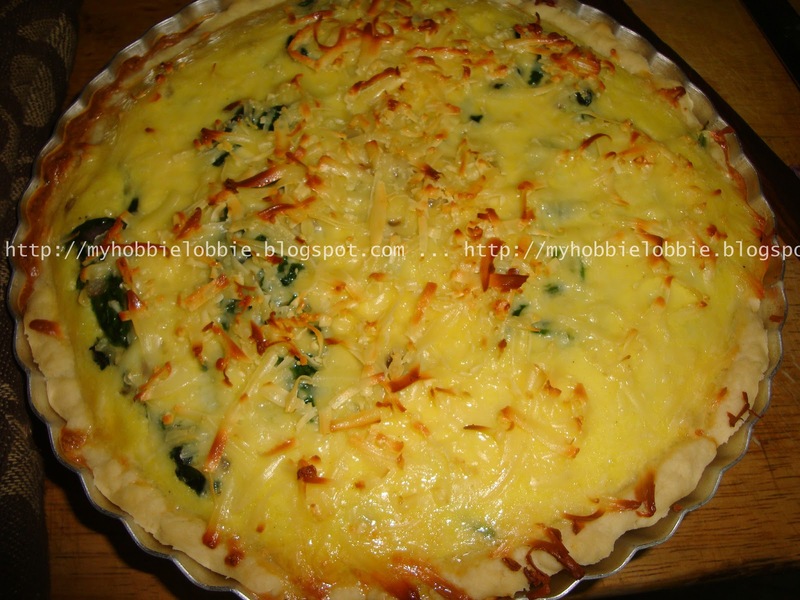 very inviting and perfectly made spinach quiche !! Trisha, I'm so glad you're back! I've missed you and your wonderful recipes! Quiche is one of my most favorite things. Yours looks so fantastic! So happy to have you back at "A Little Birdie Told Me..." my friend! What a yummy quiche. Love it.